For Drive-In Theaters, an Unexpected Revival Modern technology might make drive-in movie theaters seem antiquated. But between moviegoer nostalgia, theater-owner innovation and competitive pricing, the drive-in is staging something of a comeback. 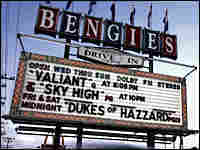 Another survivor: The Bengies Drive-In, serving Baltimore, Md., moviegoers since 1956, has what it says is the country's biggest movie screen — a 52-foot by 120-foot monster. In this era of video iPods and minivan DVD players, a renaissance in the drive-in movie business seems unlikely. 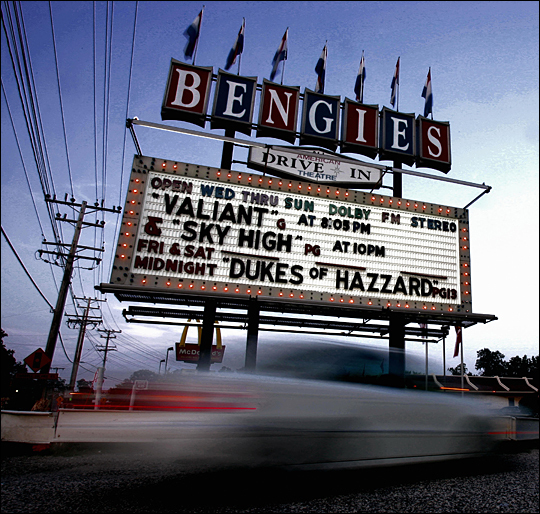 But in the past decade, nearly 100 drive-in movie theaters have opened or re-opened. One example of this trend: the Solano Drive-In Movie Theater in Concord, Calif.
At 7 p.m., even before the manager opens the box office, there's already a line of cars waiting to get in. It's a bargain at $6.75 for an adult. Children under 11 are free. Now that the sound of the movie comes through the car radio, there aren't any speakers on poles to negotiate, and moviegoers can park their cars anywhere. In front, by the big screen, a group of neighborhood families have parked their cars in a row so their kids can watch the night's movies together. One of the moms in the group, Linda Ziegler, says she found out about the Solano last year. "It's a fun thing to do," she says. "You'll see a lot of people come out with chairs and blankets and sleeping bags and whatnot." The Solano opened in 1964. Three years ago, it was shut down; the worn-out concession stand had become seedy, the parking lot potholed. Linda Alley, who was working the box office the night it closed, says she cried. "I didn't want to see this drive-in close," she says. "Nobody wanted to see it close. Everybody around here loves this place." People wrote letters pleading for the Solano to be reopened. The theater's owners made an about-face and spent thousands of dollars revamping the place. They patched the potholes, painted the screens and upgraded the food. Now the Solano is open 365 days a year, rain or shine. It's a typical move for a drive-in looking to stay in business, says Jan Krawitz, a professor of film at Stanford University. She says sprucing them up and multi-tasking the land are key steps towards the success of 21st century drive-ins. Multi-tasking? Yes indeed: On Sunday morning, the popcorn from the night before has been cleaned up, and the Solano Public Market and Swap Meet is open for business. Five thousand people have paid $1.25 to walk around and buy anything and everything from kitchen bowls to car tires. And on April 24, the Solano Drive-In Movie Theater will celebrate the 75th anniversary of drive-ins in America with a free double feature — The Wizard of Oz and Rebel without a Cause. Show time is 8 o'clock.